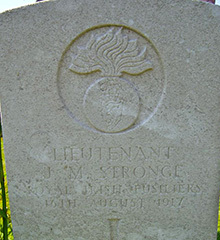 James Matthew Stronge was the only son of Sir James Henry Stronge D.L. and Ethel Margaret Stronge. James Matthew was born on 10th January 1891. The family lived at Tynan Abbey, County Armagh. 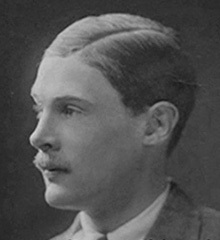 James Matthew Stronge attended Reading University College between 1911-13. Lieutenant James Matthew Stronge was serving with the 9th Battalion of the Royal Irish Fusiliers when he was killed in action at the Battle of Ypres on 16th August 1917. He was 26 years old. He had been married just weeks before his death to Winifred Alexander of Carrickmore. Brandhoek New Military Cemetery No 3 is located 6.5 km west of Ieper town centre, on the Zevekotestraat, a road leading from the N308 connecting Ieper to Poperinge. From Ieper town centre the Poperingseweg (N308), is reached via Elverdingestraat then directly over two small roundabouts in the Capronstraat. The Poperingseweg is a continuation of the Capronstraat and begins after a prominent railway level crossing. 6 km along the N308, after passing the village of Vlamertinge and just beyond the church in the hamlet of Brandhoek lies the left hand turning onto the Grote Branderstraat. After crossing the N38 Westhoekweg, the first right hand turning leads onto the Zevekotestraat. The cemetery is located 300 metres along the Zevekotestraat on the left hand side of the road, beyond the N38 dual carriageway, which it is necessary to cross.